After that, this was me with a FAKE smile among the relax smiles of the rest after a dream-crasher moment. 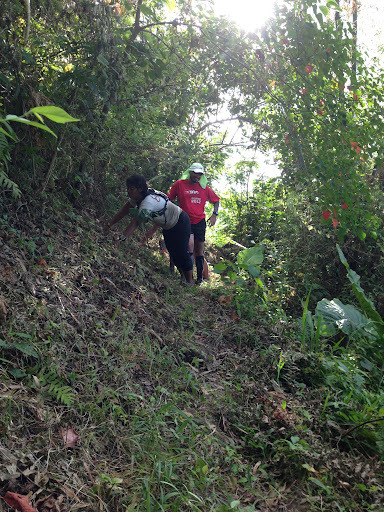 This was when the first part of the Trail Run Series 1 was finally over, which was estimated to finish at 12PM. But thanks to me, they got a bonus — it was extended to 5PM! All-in-all, the 30KM was done in 12 hours. It’s a given that it would not be easy. At the start of the last (around) 3km of part 1 of the 1st Cebu Trail Runners Series, I need to pass on a pathless side of the mountain to get to the other part. It’s when I found myself hanging from a what was left of a plant being slashed down on the side of the mountain. Think of the opposite of mountain goat, and I was like that – a pig, minus a pole inserted, waiting to be lechon placed on the side of a wall. I would probably not die from it, but it did not fail to make my spirit fly out of my body. The last time I cried in a run was during the AWUM 2012. But it was from pain and tiredness. This time, I was not in pain, maybe tired. Thankfully, RJ came out to help me. But the Cebu Trail Runner’s route was still not satisfied, I again found myself hugging with arms open wide the side of the mountain. I felt I was hanging on the side of the mountain again. Only this time, I was just holding on to a cute root of a plant. Think of pregnant spiderman minus its stickiness. IT WAS JUST ALL WRONG when everyone passed it with ease! Thankfully this time, McGyver Meyux came to help me, and taught me how to save myself from falling, but most of all from embarrassing myself in the future (if ever there will be) by knowing where to stick my foot. After that soul-shaking experience, I was like floating to wherever it was we needed to go. I was crying inside for my dream. Sorry, you found a clumsy lousy host. It seems were not meant to be. I got back to my senses when finally, I could hear the karaoke louder. It was the first time in my life I was not annoyed hearing a karaoke blasting off. The out-of-tune karaoke singer meant civilization, road, and habal-habal (motorcycle for rent); and finally I would be shipped away from the TRAILS of the Cebu Trail Runners. After acrobatic sliding myself down the last few stretch, I held a live wire. Seriously, what was the odd of only me being electrocuted out of the 6 of us who passed the same route?!? Thankfully, it did not leave a mark of big letter L (for loser) on my forehead! On the other hand, I wish it did to remind me of where I should I place myself — running… after stories of runners from road to trail. I really wish I could paint a better picture of the Trail Running Series 1 (Part 1) of Cebu Trail Runners because it was really BEAUTIFUL!!! But somehow, the only thing my mind can recall is of me hanging from the side of the mountain holding on to a tiny root of a plant. I badly wish the rest had forgotten it because it was I-wish-the-earth-open-up-and-swallow-me kind of embarrassing moment. Anyhoo, I will not pass it without putting more notes about it! And, also for people like me (I wish none are like me), here’s a glimpse of how REAL LEGIT TRAIL RUNNERS do their thing! I was hesitant to join their Trail Running Series because Meyux, then Lyra and Nap are like that exclusive elite club. But then the curious in me just could not resist it. 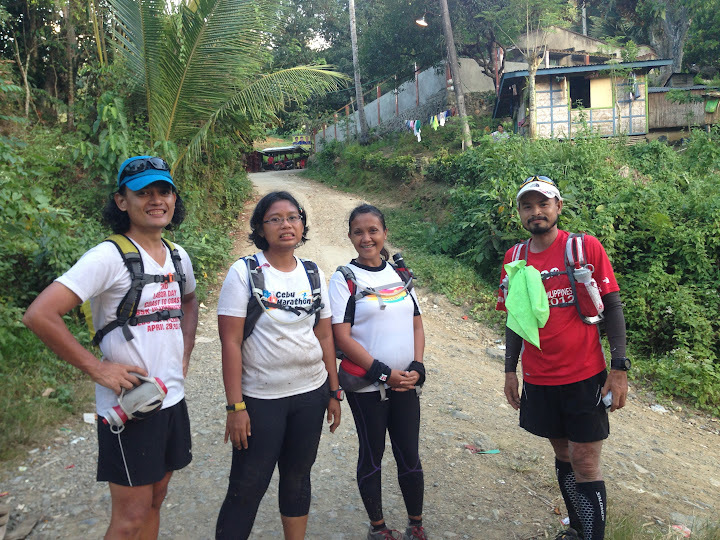 The three of them will be joining the TNF (The North Face) Ultra Trail Philippines for the nth time. Aside from experiencing their kind of TRAILS, I was also excited to see how these people train. And, since TNF is one of my foot races bucket-list. I was thinking that by going with them, I could get a gauge if I’m cut for TNF (and other trail races) or not. TRAIL foot races: YES! Oh, NO! Yes! Oh, NO! Maybe! So during the run/trek, every after portion of the route, I was assessing myself if it’s a YES-NO-MAYBE-TRY-LUCKY-NO-YES-MAYBE in my head. YES! The color of the world is just so beautiful when you’re out there. NO! MAYBE! “Namayabas!” It’s a trail, only non-existent yet. NO! There must be a better way of doing this?!? Like Nap buying the entire Cebu. Lyra. Guess what’s inside her hydration backpack?!? NO! Bringing almost more than 2 kilos at my back for hydration like Meyux, I cannot. I’m already slow without bringing any thing. How much more when adding more weights to my fats. YES! Fresh fruits along the way. The sweetest juiciest star apple! If Nap is not buying mountain lots, he’s buying fruits. YES! The view once you reached the top can totally erase the punishing steep uphill climb. YES! Fire road is my kind of trail. I don’t care if sun’s meanness was full blast, and it’s going all the way up! NO! Cramps. Thanks to this random spring along the fire road. NOOOOOOOOO! PERIOD!!! Pathless off-camber trails at mountain-side is my death for having no footing skills. Actually, it’s more of I have non-coordinated body parts movement. I was already rescued at this time. Before this, I was lying flat on my stomach with my feet dangling falling (that was how I felt). The side of this is like a cliff/ravine. HORRIBLE! But I wish it was captured as a reminder to myself to better stay away from Meyux’s trails! More pics at Cebu Trail Runners’ page here >>. Interested with trail running (or falling), you can check Cebu Trail Runners here >>. If you’re trail trekking skill level is somewhere around mine, imagine yourself hanging on the side of the mountain before deciding to join them. If you’re still determined to try their events, make sure to bring a contact number of ERUF and rescue centers (if ever we have here).